Opening Hours: The Bible Garden is open to the public for informal visits in daylight hours. Location: Located at 6a Mitchell Road, Palm Beach, NSW Australia. By car: Palm Beach is about 40km by road north of the Sydney CBD at the far north of Sydney’s Northern Beaches. Mitchell Road sits high above the southern end of the beach, starting at the junction of Pacific and Ebor Roads. By bus: If using public transport from the Sydney CBD, catch an L90 Palm Beach bus from Lee Street (Railway Square) or Carrington Street (Wynyard). Alight at the Palm Beach terminus, then walk to the south end of Palm Beach, up through Horden Park, cross Florida Road, take the marked walking track (these are steep steps) up to the junction of Mitchell, Pacific and Ebor Roads, and the Bible Garden is 100 metres along Mitchell Road. (The walk is about 1 kilometre). 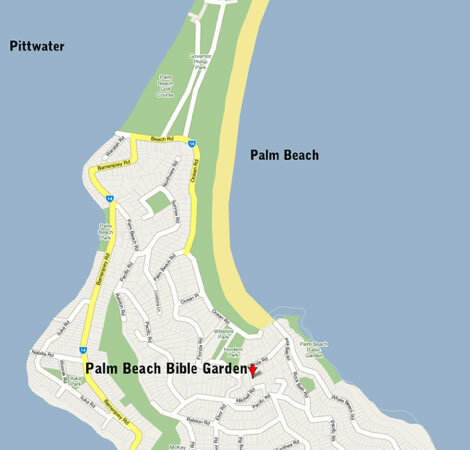 Click here to see the location of Palm Beach Bible Garden.